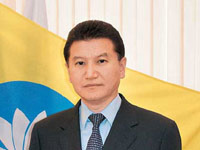 November 27, 2012 President of FIDE, the former President of the Republic of Kalmykia, billionaire Kirsan Ilyumzhinov met with a delegation from Sri Lanka, reported by the Kirsan Ilyumzhinov. During this meeting it was agreed that in the spring of 2013, the Buddhist Republic of Kalmykia will be brought the germ of the Bodhi tree under which Buddha attained enlightenment, according KalmykiaNews. On 23 of October the FIDE President Kirsan Ilyumzhinov (First President of Kalmykia) had a working visit to Dubai. The FIDE President billionaire Kirsan Ilyumzhinov (First President of Kalmykia) had a meeting with Sheikh Nahyan bin Mubarak Al Nahyan, Minister of Higher Education and Scientific Research of the United Arab Emirates. A chess development in the country was discussed during the meeting. A special attention was paid to the introduction of chess to the school curriculum. Yesterday the 1st President of the Republic of Kalmykia, FIDE President Kirsan Ilyumzhinov visited Azerbaijan on a working visit, where in Baku he met with H.E. Ilham Aliyev, president of the Republic of Azerbaijan. During the meeting, the issues of chess development, in particular the realisation of the Azerbaijan government programme for chess development in 2009-2014, were discussed. Russian oligarch buys Bulgarian oil company “Petrol Holding”. Former President of the Republic of Kalmykia and President of the World Chess Federation (FIDE), Kirsan Ilyumzhinov, became a majority owner of the largest Bulgarian fuel distributor “Petrol Holding”. The Switzerland-based company “Credit Mediterranee”, owned by Kirsan Ilyumzhinov, has bought the shares of Dennis Jersov and Alexander Melnik which amounted to 52.5%, the remaining part of 47.5% belongs to the Bulgarian businessman Mitko Sabev. The President of the World Chess Federation and ex-president of Russia’s Republic of Kalmykia, Kirsan Ilyumzhinov has bought a 52.5% stake in Bulgaria’s largest fuel company Petrol Holding. Swiss-based Credit Mediterranee owned by Kirsan Ilyumzhinov bought the 47.5% stake owned by Denis Ershov and the 5% stake owned by Alexander Melnik, Vedomosti Daily reports. Ilyumzhinov plans to buy 100% of Petrol and is currently engaged in negotiations with another shareholder Mitko Sabev, who holds a 47.5% stake. FIDE held it’s Second Quarter Presidential Board Meeting in Elista at the same time as celebrating its President, Kirsan Ilyumzhinov’s 50th Birthday. Amongst the celebrations, Kirsan Ilyumzhinov was awarded the title of Hero of Kalmykia. Legendary billioner Kirsan Ilyumzhinov from Kalmykia.